At the heart of most galaxies lies a supermassive black hole. How such black holes came to be is a matter of some debate. Did black holes form first, and galaxies later formed around them (bottom up model), or did galaxies form first, and only later did their cores collapse into a black hole (top down model). To answer this question we need to have a good understanding of when these black holes started to form. A new ultra-deep x-ray image is helping to answer these questions. A deep field image is one that has a clear view of very distant objects. The most famous deep field is the Hubble Ultra Deep Field (HUDF), which showed us just how many galaxies there are in the cosmos. The HUDF was in the visible and infrared, but there are others such as the ALMA Deep Field, which was taken at microwave wavelengths, which gave us a view of distant gas and dust. Now the Chandra X-ray Observatory has taken an x-ray deep field, which gives us a view of distant black holes. Black holes don’t emit light themselves, but the gas and dust near a black hole can become superheated by the gravitational squeezing of the black hole. Such “active” black holes can emit huge jets of plasma that give off intense x-rays. By studying these x-ray emissions, we can determine things such as the size and rate of growth of the black hole. This new deep field image gathered light from supermassive black holes when the Universe was about 2 billion years old. Since the region observed was the same as the Hubble Deep Field, the team could match x-ray black holes to galaxies in the Hubble deep field, and get an idea of the size and evolution of the black holes and their galaxies. What they found was that the “seeds” for these supermassive black holes were likely on the order of 10,000 to 100,000 times more massive than our Sun. This would tend to support the bottom up model where black holes formed first. If the top down model was correct, we would assume the seeds would be smaller, on the order of 100 t0 1,000 solar masses. This new data doesn’t completely rule out the top down model, but it is consistent with other evidence that supports the bottom up model. Right now it looks like black holes formed early in the Universe, and this triggered the formation of galaxies around them. A while back I read that the smallest known supermassive black hole was at the center of a dwarf galaxy, weighing in at about 50,000 solar masses. So, if you had the question of ‘how big does a black hole have to be to trigger a galaxy?’, that might be the answer. So, if the black hole forms first, is a galaxy really just a black hole accretion disc that’s staving off the inevitable for a few billion years ? In the bottom model what do the black holes eat to get these masses? 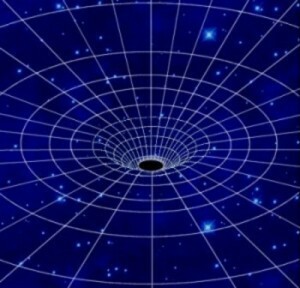 The black holes we see them but what brings them into existence? A beginning and end? Your the smartest person I have ever had the pleasure to read your perspective of things and how they evolve in our universe so what role do the black holes play?